Be honest. You probably have a couple unfinished projects lying around your house. I know I do. I was recently cleaning up some craft supplies and came across a couple older Paper Pumpkin kits that I had not assembled yet. I had two older kits from last year, that I just hadn’t gotten around to doing something with. One of them was this kit from July last year. It’s a cute kit, but I hadn’t bothered making up this kit because it’s boxes and I didn’t have an immediate need for the eight boxes. And assembled boxes take quite a bit more room to store than unassembled boxes. I decided that I really needed to come up with something to do with this kit once and for all. It had sat in my “to do” pile way too long. My friend Poli suggested I use the boxes as more of a decor item rather than as gift boxes as intended. What a great idea! That made so much more sense than to save them for someday when I might need eight boxes that matched. The more I looked at the boxes, I thought it was something that my daughter would like, but the green wasn’t the right choice for her room. I stuck with just the copper polka dot boxes and the Calypso Coral tassels. I had enough boxes to spell out her name so this is what I came up with. I alternated the large boxes and the small boxes, and to keep the symmetry I added one extra box on the end. The circles and gold letters were left over from another Paper Pumpkin kit. I punched a hole in the bottom of the four boxes that have the tassels. Otherwise all the boxes are sealed closed. Each box is knotted onto the white baker’s twine to hold them in place. I used some Command Hooks to attach it to her bedroom door. When she gets bored with this, we’ll take it down and replace with something else or just remove the hooks. I love that the Command Hooks come back down without a lot of mess or fuss. These are perfect for decorating a teenager’s room. 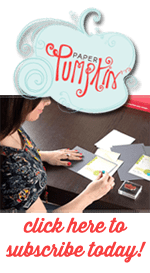 Paper Pumpkin is a subscription kit that ships automatically to your door every month. It’s only $19.95 and that includes the shipping. The kits are a surprise every month. 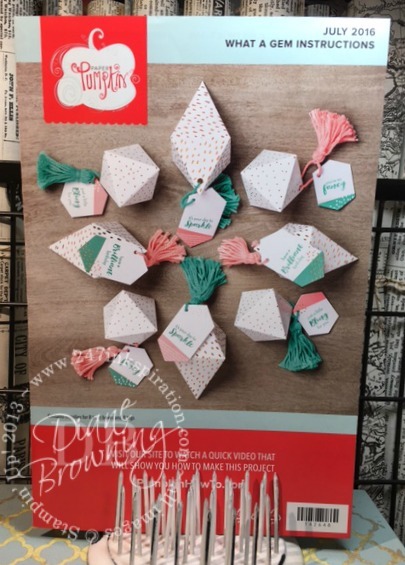 They are a mix of cards, treat bags/boxes, and home decor items. You can sign up for a Paper Pumpkin subscription by clicking the link on the left side of this page. If you want to try it out before committing to an ongoing subscription, you can purchase a pre-paid subscription for 1, 3, 6, or 12 months. Don’t forget Sale-abration is going on right now. For every $50 purchase (pre-tax and shipping), you can pick one free Sale-abration item. What a deal! I don’t know about you, but I’m always looking for a good deal which is why I signed up to be a Demonstrator. If you always want to get your craft supplies at a discount, we need to talk.